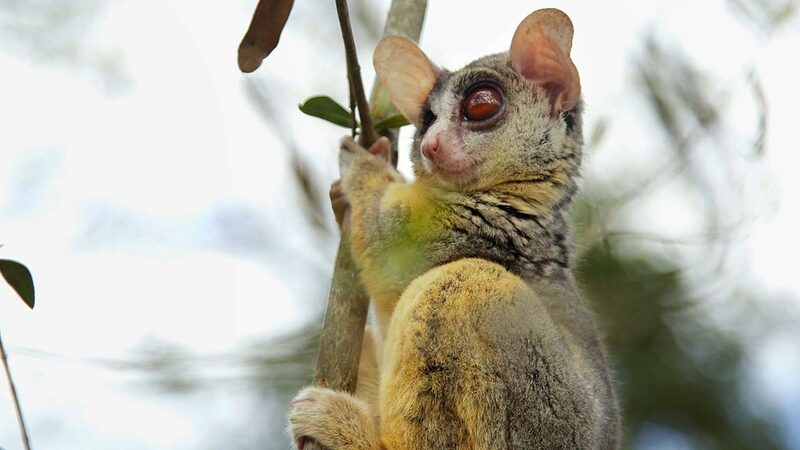 At night, flashlights scanning the trees will shine red off the eyes of Senegal bushbabies, as the animals leap around in and among the trees. When they fall, they always land on their feet. On the ground, they hop on their two hind legs. 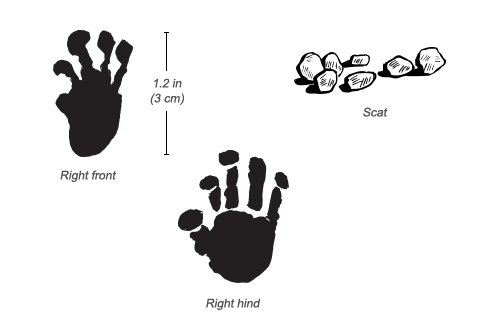 In one study, these bushbabies hopped as far as 164 feet (50 m) while foraging on the ground. Why are fires especially dangerous for bushbabies? Fires destroy their food sources. Fires destroy their favorite nests and resting places. Fires expose them to predators. 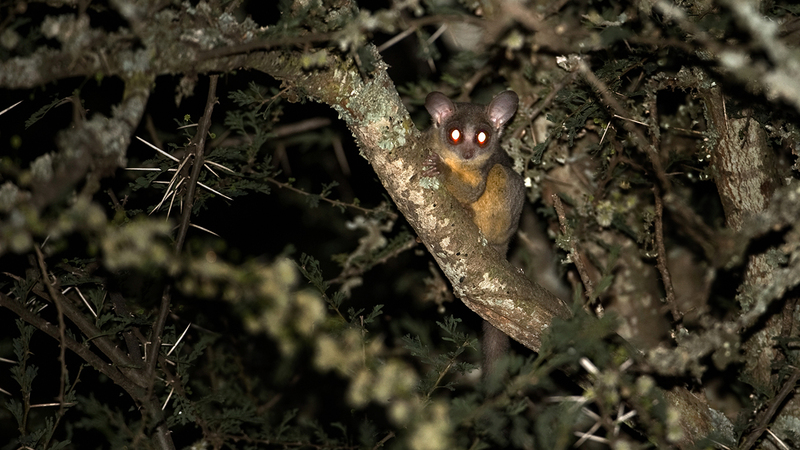 Fires are especially dangerous for bushbabies because they force the animals to come out of their hiding places. As they flee to safe ground, they are exposed to hawks. 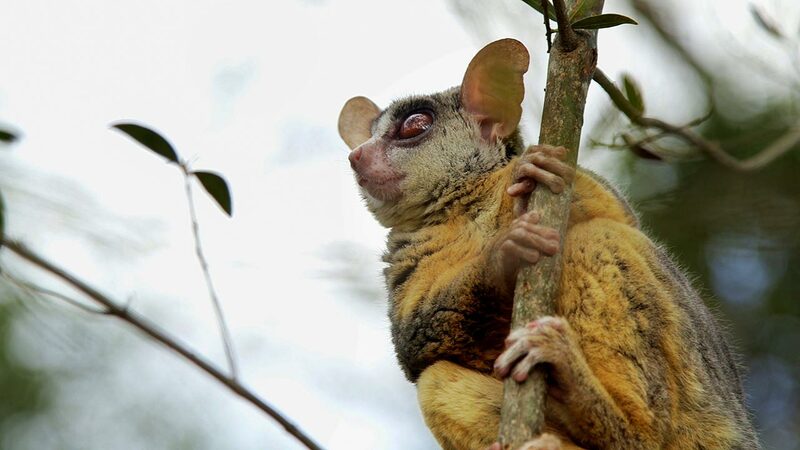 Senegal bushbabies, or galagos, live and forage independently or in small groups of two or three. Males are more likely than females to venture from the area where they were born. Bushbaby males tend to be more tolerant of other males (so long as they are smaller or submissive) than females are of other females that enter their ranges. Bushbabies have large, highly mobile ears that move independently of each other. They can hear a wide range of frequencies, from 250 to 64,000 Hertz. (Humans can only hear up to 20,000 Hertz.) The high-frequency calls between mothers and infants probably evolved as a warning tool, since raptors—likely predators—cannot hear these frequencies. Adults use 18 distinct calls, but their low-pitched woo is their loudest and most distinctive call. 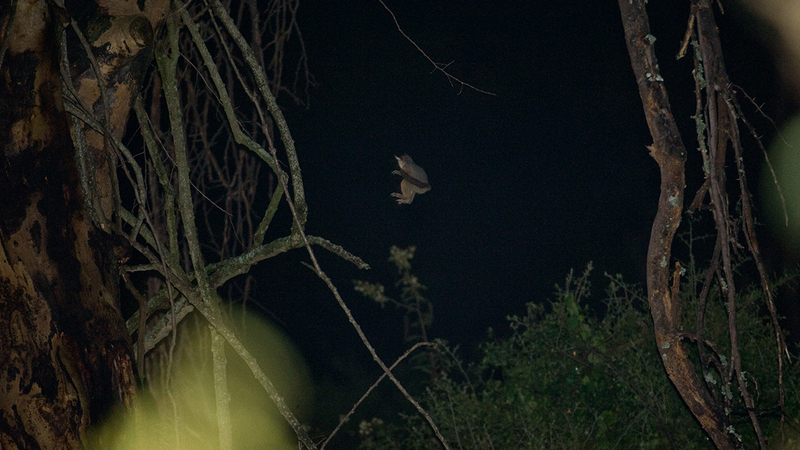 Active from dusk until dawn, bushbabies spend only one percent of their time on the ground. The majority—59 percent—of their time is spent less than 33 feet (10 m) from the ground in trees and bushes. A mother “parks” her infant on a limb while she forages during the night, then picks up the baby before dawn to return to their nest high in the trees. 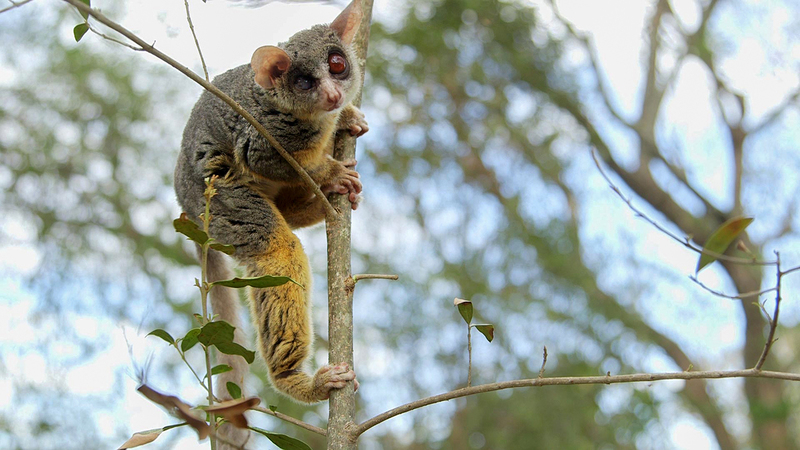 Bushbabies make their nests out of vegetation or use an abandoned bird’s nest or an unoccupied beehive. 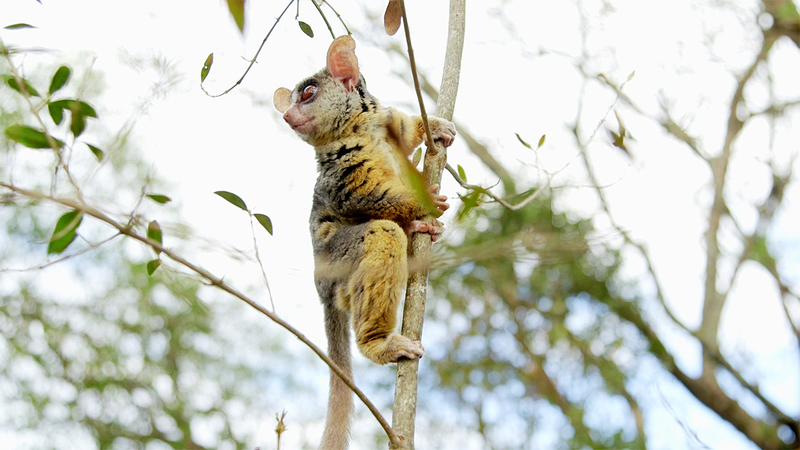 Bushbabies are widespread, and their habitat has not been greatly degraded by human populations. Found in tropical Africa, bushbabies range from western Africa to East Africa and south to Mozambique. In Laikipia, in Kenya, bushbabies depend on whistling thorn and yellow fever trees, preferring savanna woodlands and bushlands over areas with tall grass. An individual’s home range covers about ten acres (4 ha). 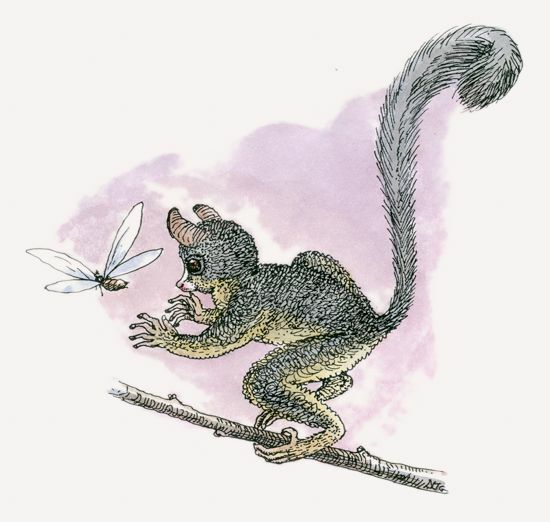 During the dry season, Senegal bushbabies depend on gum from whistling thorn andyellow fever trees. Tree gum remains an important resource throughout the year and is supplemented by caterpillars, spiders, scorpions, termites, nectar, and fruits. Each year there are two birthing seasons. The timing varies geographically, possibly determined by changing temperatures and/or food abundance. Gestation lasts 139 to 143 days, and weaning occurs between 10 and 14 weeks after birth. Occasionally bushbabies will give birth to twins, which can make it difficult for mothers since they carry their young in their mouths when they travel. In a group where a mother and her adult daughter have infants at the same time, the grandmother may nurse her grandchild. Bush babies have many terrestrial and avian predators, including small cat species, owls, and snakes. Scientists suspect they carry yellow fever virus, which can cause severe illness in unvaccinated humans. 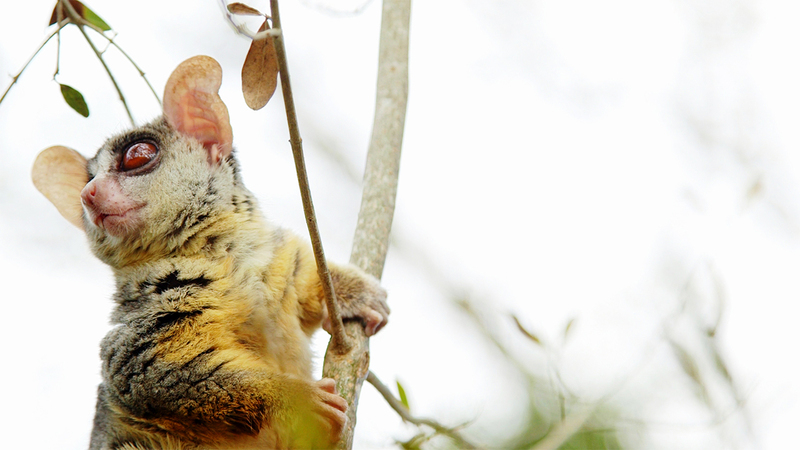 In the bushbaby’s preferred wooded habitat, more than 20 individuals can live in a 2.5-acre (1-ha) area, but the density can decrease to one individual in more bush-heavy habitats. At just ten days old, a bushbaby the size of a baby rat can leap six inches (15 cm) in its arboreal habitat!